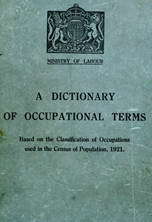 (in London and S. England) see painter's labourer; for N. of England usage, in sense of painter, cf. brush hand (592). chips and scrapes old paint, rust, or "scale" off any kind of ironwork (ships' plates, gasometers, etc.) in preparation for painting or repainting, using a pneumatic tool, a small chipping hammer, or other hand tool. fills in blemishes or crevices of vehicle bodies with stopping of putty or special preparation; applies primary or first coat of paint, and, when dry, rubs down with pumice stone and water to make even surface for final coats of paint. applies dope (special waterproofing composition) lay hand, with, a brush, to fabric of aircraft to tighten it, to render it airtight and watertight, and to reduce friction. applies filling (first rough coat of paint) by hand, with a brush, to castings, which have not been machined, and rubs surface down with glass paper to produce smooth surface for finishing coat. fills in grain of wood by rubbing in special composition, in preparation for polishing or painting, to ensure smooth surface; or, lays on first series of "primers " (groundwork paints). cleans frames of self-propelled road vehicles; sand-papers or otherwise scrubs off rust and roughness prior to painting, polishing, or enamelling. paints red spot or other coloured mark on painted golf ball with brush and paint. a painter's labourer (q.v.) who applies coat of lead paint to woodwork, and fills in cracks, etc. applies anticorrosive bitumen or bitumastic solution to any kind of ironwork, with a long-handled tar brush. (ii) places golf ball in special paint spraying machine; switches on or off driving power of machine; fills troughs with paint; removes painted balls when dry. paints or varnishes patterns i.e., patterns, usually wooden, of sections of machines used by engineers) by hand, with a brush. applies tar, with brush, to wooden buildings, fences, etc., or to sides, top, and bottom of coal bunkers on ship; cf. tarrer (581). sprays paint, with spraying apparatus, on finished tin boxes, canisters, etc. paints finished iron and steel tubes with brush or spray. cleans brushes, stirs paint, carries and sets up ladders, etc., and lays scaffold boards on trestles; scrapes off rust, old paint, etc., and assists painter (592) (q.v.) generally; sometimes does low grade painting work under supervision of painter; washes walls, ceilings, etc., with lime, and puts on first wash ready for white-washing; strips off old wallpaper from walls, using water and stripping knife or scraping tool. a chipper q.v. who stands on a pontoon moored alongside a vessel and scrapes lower parts of hull therefrom; cf. ship scaler. a painter's assistant (q.v. ) who scales, scrapes, and applies first coat of paint (red lead) to surface be painted (e.g., to interior and exterior of ship's hull); sometimes also applies anti-fouling composition to ship's bottom. removes roughnesses from surface on woodwork of railway coach, tramcar, etc., with glasspaper, pumice stone or powder, etc., and applies priming and primary coats of paint, rubbing down when each coat is dry, in readiness for painters; may also apply coat of flatting paint; cf. frame cleaner, flatter (593). see chipper ; cf. scaler (952). (ii) softens old paint with blow lamp, and scrapes it off with a tool; often done by painter (592) (q.v.). a chipper (q.v.) who cleans plates of a ship, inside and outside, in preparation for re-painting; or who scrapes ship's bottom, in a dry dock or in a slip way, to detach barnacles, seaweed, etc., using hammer and chisels, files and sometimes a shave hook, a small hand scraping tool. applies a coat of size or similar substance to wood work, plaster walls, paper, etc., to render surface less absorbant [sic] for painting or varnishing. applies a coating of stopping paste with putty knife to provide a smooth foundation on safes for paint. applies varnish (a solution of resins in oil or spirit) with brush or spray to painted, stained, or enamelled surface of wooden or metal articles, e.g., furniture, in order to give a polish and a hard protective covering, sometimes specifically designated, e.g., handle varnisher, reed varnisher (textile), stock varnisher (gun), wire mattress varnisher; often also done by painter (592) (q.v. ); cf. varnisher (vehicles) (593), varnisher (paper) (549). feeds rollers of varnishing machine with tinplates; removes varnished plates in racks to ovens. washes ceilings, strips paper, and otherwise prepares surfaces for painters and paperhangers. coats lengths of wood moulding with a mixture of whitening and size by hand or by machine.